The University of Waikato’s Gender Research Network and Rainbow Alliance will host a Diverse Genders and Sexualities Symposium. Researchers, activists, artists, and community groups are invited to present (art or a performance, a five minute talk, a 15 minute talk, a panel discussion) on the topic of gender and sexual diversity. The key organising principle will rest on the ways in which genders and sexualities intersect with each other, and with other identities, such as race, ethnicity, indigeneity, class, age, abilities, and so on. We will invite speakers to discuss power and privilege of certain identities amidst, for example, colonisation, heteronormativity, homophobia, and transphobia both here in Aotearoa and beyond. We also invite presenters to celebrate the diversity of genders and sexualities by reflecting back on 125 years of Suffrage in Aotearoa. 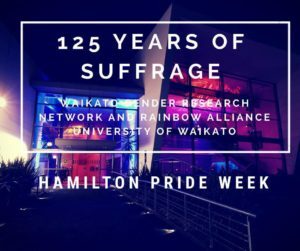 125 Years of Suffrage | Waikato Gender Research Network and Rainbow Alliance University of Waikato | Saturday 8th September | 1pm – 5pm | Te Whare Tapere Iti, Gallaghar Academy of Performing Arts, Waikato University | Free Entry | See you there!